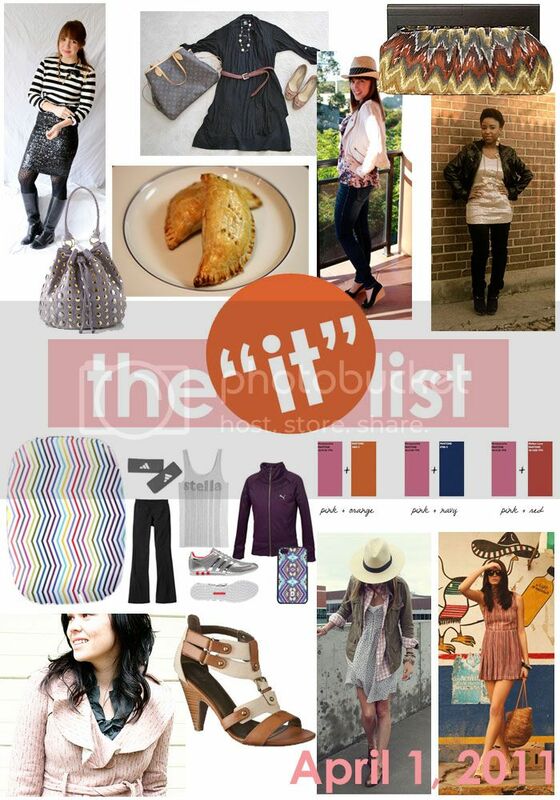 100 Inspirations: the "it" list... April 1, 2011! the "it" list... April 1, 2011! It's hard to believe that April is already here... That means that for many of you spring has arrived or is very, very close! Take some time to be inspired by these amazing blogs today to celebrate! strong sense of style is loving the tribal trend right now, ohhhh - so am I! I love that she chose simple items that you can add to your current wardrobe! thought and musing looks fabulous in this road-trip outfit! I love that her simple floral top dressed the whole thing up (and what about that hat?!?! LOVE!). keep collected seriously rocks daytime sequins and stripes. I want/need a sequined skirt after seeing this outfit! a spoonful of dish takes one simple black dress and dresses it up in four fun outfits - there is something for everyone here. I just love these outfits! the IT list is put together by jill of good life for less - click here for information on how you can be involved! the "it" list... April 29, 2011! the "it" list... April 22, 2011! top 15 under $100 - week 29! the "it" list... April 15, 2011! top 15 under $100 - week 28! the "it" list... April 8, 2011! top 15 under $100 - week 27!